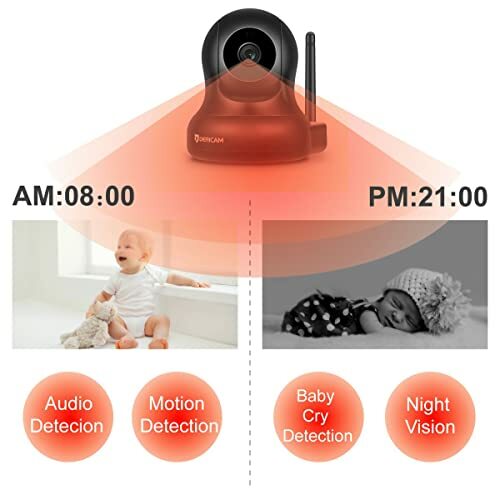 Are you looking for an inexpensive yet great quality of home wireless security camera? If your answer is yes, then, you’ve probably come to the right place! I have been searching for a great security camera for the past few months now and I’ve tested a lot of products already. To be honest, I am no expert when it comes to security systems or surveillance cameras. I am no tech-savvy, that’s true, and I consider myself as a newbie in this line of industry. However, my search for the past few months allowed me to get a hold of various security cameras. And in these cameras, I found many great and not-so-great ones. Nevertheless, I’ve listed one camera in this guide for you to check out. This might be a good fit for you! Today, Dericam offers a wide range set of products focusing mainly on security cameras. But the new 1080P Home Wireless Security Camera caught my attention as it offers all-inclusive features at a very low cost. Imagine this: for a hundred-dollar, more or less, you could already have a pretty decent indoor wireless security camera! Basically, it’s pretty neat package for a decent surveillance camera. 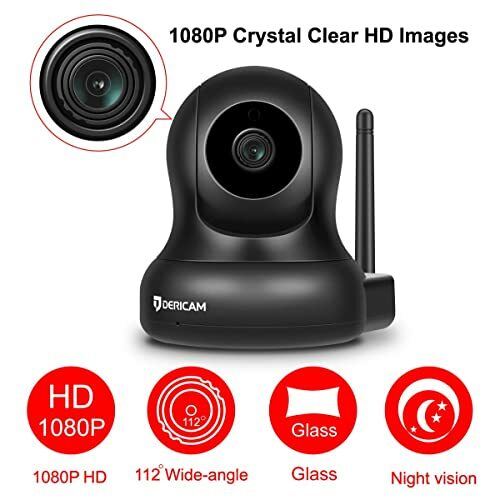 What To Expect When Buying The Dericam 1080P Wireless Security Camera? As I mentioned above, I’ve put up this guide to help you find the most appropriate security camera for your unique needs. But, remember that there’s no such thing as “perfect product.” So, expect that there will be advantages and edges, but there will be downsides and drawbacks too. One of the things I like about the Dericam 1080P Wireless Security Camera is its ease of installation and setup. Believe it or not, you could finish the entire setup in just 5 minutes! And that is a plus point for me as I really like cameras that provide convenience especially for installation and setup. Primarily, you’ll just connect the camera to your router using the network cable. And once everything is going well, just unplug the cable and the camera is already running on your wi-fi. You could maximize the use of the user manual too. However, there are certain pages from there that I find very difficult to understand. And I tried researching from the internet instead. Now, the overall setup also includes the connecting processes between the camera and your smartphone or tablet. It is done through its dedicated app named Free Dericam that is compatible with both iOS and Android platforms. Since I have mentioned already the dedicated application for this camera, I’ll elaborate the things that you must consider in this feature. As the name states, the application is free and compatible with almost all devices available today. In the said application, this is where you’ll get your alarms and notifications such as snapshots and short video footages. And since it is a two-way audio security camera, you’ll need the application in order to communicate with the people in the monitored area. But, audio features may sometimes cause lag issues. In addition, it is also compatible with many third-party apps such as iSpy, Live Cams Pro, and Tinycam. While the app may be simple to utilize, it shows a few connectivity and compatibility issues on other Android devices. The 2018 version of the Dericam 1080P Wireless Security Camera comes with two antennas. One is the 2.5 dBi antenna which is the standard type and the other one is a much stronger type – 5.0 dBi antenna. If you want a stronger connection to your wi-fi, you are free to do so because of the 5.0 dBi antenna. You can install the camera on a much farther area from your router which is great in my case since my router is located on the ground floor. And I have to install my camera on the upper grounds. But, here’s the catch – these antennas only work with 2.4 GHz wi-fi modules. If your connections are running on 5 GHz wi-fi modules, then the camera won’t work. This is probably one of the main drawbacks of the camera as it limits the flexibility of usage. I have to commend the camera lens of the Dericam 1080P since it pretty much offers a clear and fine resolution of footages and images. And for a security camera at this price rate, it’s quite great! The camera features crystal 3MP glass lens. It also has night visions too that can range up to 26 feet and complemented by 10 12MIL IR leds. Moreover, it supports 360-degree horizontal pan and 120-degree vertical tilt. In the dedicated app, you could store video footages and images in there too. You could access a free 16 GB storage space on its cloud which I must say a good feature since most cloud storages of other security cameras are paid services. For 45 days, you could store your data. Also, it can support up to 128 GB of micro-SD card but it’s not included in the package. So, you need to purchase it separately. Well, it largely depends on your preferences. If you are looking for an inexpensive but decent security camera – this could work for you. But, if you need a more advanced security camera, you may want to consider other products that could offer you innovative solutions that are tailored according to your needs.